Essential Ravensara oil is an excellent natural remedy for almost all viral infections. It works powerfully against tension and stress, but also raises our immune system. This natural substance is often present during the treatment with aromatherapy, and is used for massage. It has a positive effect on our body, where it reduces pain to a great extent. It is used often for inhalation but also for other respiratory diseases. In a short period of time it will alleviate existing ailments and will strengthen the body. Continue reading to find out how to use ravensara oil against viruses. Here you can find some tips for removing warts and herpes. Stay tuned. How does Ravensara plant look like? 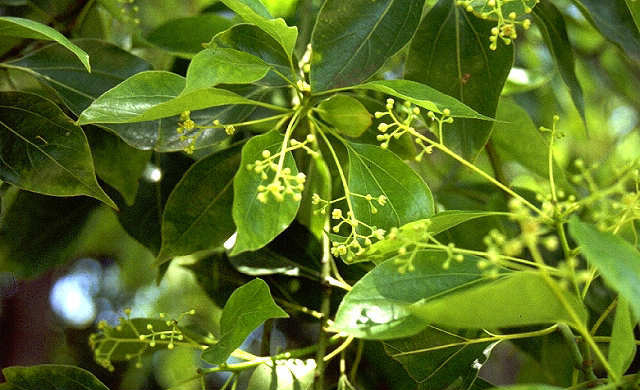 Many think that the Latin name for this herb Ravensara aromatica, but in fact the essential oil is obtained from the plant Cinnamomum camphora. It is located in Madagascar, but is originally from Taiwan. People even call it Madagascar camphor. Ravensara oil is produced by distillation of its leaves. It is an evergreen plant with yellowish brown tree color, reaching height of 15 to 30m, it has a well-developed root system. Treetop is branched, leaves elliptical, smooth and leathery, they are crushed they put out pleasant smell of camphor. The flowers are a small and yellowish-white, and fruits are like berries. His plant belongs to the family of laurel (Lauraceae). Due to changes in habitat plant has changed its original characteristics. Ravensara oil is rich in cineole oxide-1,8-terpineol and alcohol. However there are oil in sale, which sate that they are ravensara oil but in fact are not. These are: anise ravensara (Ravensara anisate) and Havozo oil (Agatophyllum aromaticum). If you want to buy a real Ravensara oil pay attention to the labels on products. It is essential that the camphor is type 1,8-cineole and originates from Madagascar. The declaration contains alpha-terpineol, and must not contain camphor, possibly only in traces. Because of these concerns in recent times increasingly used term is Ravintsara. In addition to mentioned substances it contains beta-caryophyllene, eugenol, sabinene, terpinene-4-ol, p-cymene, alpha and beta-pinene. Ravensara for babies is allowed from the third month of age. This is confirmed by many pediatricians. It has a mild effect and is harmless for kids, despite being very effective. It relieves cough and raises immunity, so it is a practical tool at the time of viral influenza and even in children. Of course, in this case it is used a lot more in diluted form in comparison to adults. Ravensara oil has strong immune-stimulating, antibacterial and antiviral activity. It is excellent in protection against fungi and parasites. It acts as a mild natural analgesic and appears in preparations for pain in joints and muscles. Successfully accelerates regeneration of skin, and is also used for hair care. Always follow the recommended daily dose and do not use Ravensara in large quantities. You must be careful with this essential oil. It may have neuro and hepatotoxic operation if you exaggerate with its use. It is an excellent natural remedy against depression, chronic fatigue, nervousness and tension, therefore it is particularly used in aromatherapy. Those who have trouble sleeping should definitely try Ravensara oil for insomnia. It is considered phenomenal natural aphrodisiac. Ravintsara essential oil has one of the most important features, which is a potent antiviral effect. Successfully alleviates various diseases caused by viruses and bacteria. Whether it comes to bronchitis, flu, rhinopharyngitis and various other respiratory problems. It is a perfect solution in the fight against viruses if you have herpes, warts, human papilloma virus, an infection of the digestive tract or mononucleosis. As with urinary and gynecological infections such as cystitis, leucorrhoea, vaginitis or vulvitis. 20 drops of eucalyptus oil and tea tree oil. How to prepare the medicinal preparation? Tampon soaked with this mixture, twice a day hold for two hours. Such treatment use between menstrual periods for 20 days. You can use it during the 2-4 cycles, depending on the duration of infection, viruses and reactions of your body. Bacterial vaginitis is usually caused by Gardanelle vaginalis. These are anaerobic bacteria that multiply and disturb the balance of the natural flora of the body. In this case, a good combination is 20 ml St. John’s wort oil, 10 ml of tamanu oil, 30 drops of tea tree oil and ravensara. Ravensara oil for inhalation with respiratory infections gives very good results. To do inhalations follow the next procedure. Use 600 to 800 mL of water, place 1-2 drops of ravensara and inhale for couple of minutes. Then add another drop and re-breathe for 60 seconds and proceed until you spend all 5 drops. If you use a diffuser add couple of drops in it and inhale the fumes for about 3 minutes. If you have an inhaler, in 10 ml of saline solution add two drops of oils, inhalation takes 1-2 minutes. During the day the process is repeated three or four times, with any of the above method. However, for respiratory infections chest, back and feet massage helps. Ravensara essential oil is mixed in combination with some oil which is quickly absorbent (hazelnut, macadamia nuts), with 10-40 percentage portion. If used for children, of course then a smaller percentage is used. For kids between 8 and 12 years we use 6ml of fast absorbent oil and 4 ml of ravensara, three times a day. Use 8 drops per lubrication. With smaller toddlers between 4 and 7, 8 ml is needed and 2 mL of ravensara. Three times a day massage 8 drops in one application. And for those children, aged between 1-3 years of age, in 10 ml of fast absorbent oil add 10 drops of ravensara. Rub twice a day on the mentioned places on the body (10 drops). What to do when there are those annoying red spots on the edge of the lips appear? Worse still, such herpes virus infections may occur elsewhere on the body. We know how they can be very painful and unpleasant. Ravensara oil against herpes is a very practical and efficient solution. A perfect combination is to use 10 ml bottle mixed with some drops of 20 ml of cold pressed oil. The best is St. John's Wort, but you can use sunflower, olive or another. Lubricates directly to the problem area. This mix, you can be used several times a day (before use it is necessarily to shake). It has a very efficient operation, and after just one day you will notice significant improvement. If you get to the doctor some ointment for cold sores you can use them without problems in parallel. It is completely safe to use this mix, and Ravensara oil for children can also be used in this way. What to do if fever on the lips is still not passing? In the case of long term infection in 5 ml of tamanu oil add 10 drops of ravensara, 4 drops niaulina and 2 drops of peppermint and thyme. This mixture can be applied to herpes 6-8 times a day. Human papilloma virus causes warts on the skin to which this essential oil works quite well. For this purpose, 4.5 m l of this oil mix with 5 ml of castor oil and 10 drops of cinnamon oil. On warts apply this mixture twice a day. In cases with children do not add cinnamon oil because it is too strong. Are there any side effects to Ravensara oil? The answer to this question is that it occurs very rarely and only when you overdo it with the dosage. It is quite safe in small amounts, always diluted with other oils, as we mentioned before. Before using a mixture you need to be sure to shake the bottle so the ingredients can homogenize. The thin layer is applied on problem areas on the skin. Pay attention to the quality and chemical composition of the oil, which should be precisely on the label. As already mentioned, in the medicinal purposes use camphor type 1,8-cineole. A content of camphor should be completely negligible or in traces. However, be careful when using ravensara because it cannot be administered orally in the body. You must be careful as well with other essential oils in order not to come into contact with the eyes, because they are highly concentrated. In the event that you get it into the eyes immediately wash with water and consult a doctor. Camphor is neurotoxic, but so this oil should not be used in large quantities. Although the content of camphor in this preparation is really negligible, but to be extra careful can never hurt. Also it is not recommended during pregnancy and in nursing mothers. And by no means should it be used by persons suffering from any form of estrogen-dependent tumors. Where to buy Ravensara oil and what is the price? If you plan to get oil ravensara be careful when choosing products. You are wondering, where to buy it and is it safe? To begin, first of all check in large and well-equipped health food stores. If necessary, search for it in pharmacies as well. In web shops available are a wide variety of different products, including this oil. Just inform yourself about the composition of the oil before you decide to buy it. Our recommendation is that you read on the local forums, to inform yourself better before use. Testimonials are valuable, they can help a lot in making the right decisions. Once again we note, before using ravensara oil consult your doctor. It does not hurt to listen to the advice of the practitioner about any preparation. For Ravensara oil price is quite high. A bottle of 10 milliliters costs around 12 and 15 dollars. But given the amounts that is spent, and the assistance provided in certain situations, it is certainly profitable. In the end, we recommend you a text on another great oil and preparation, sandalwood! Definitely read it!